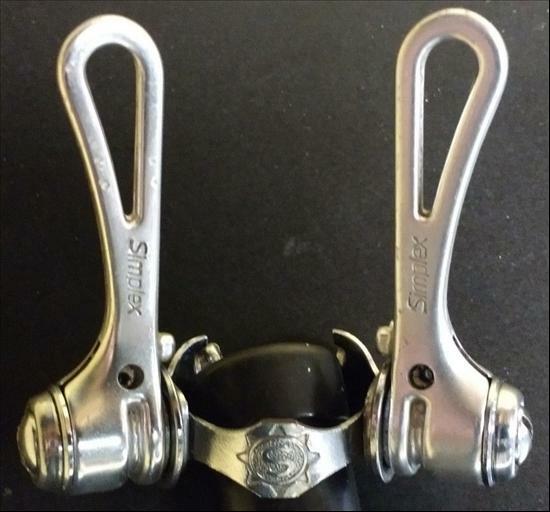 These shifters were very popular with racers who like the feel and that they slipped less than Campagnolo friction shifters of the same time period. Considered an excellent upgrade over all downtube friction shifters as well as modern counterparts by some. The open style lever was the later version of the Super LJ shifters. Available banded and braze-on. Also appeared in Spidel, Mavic and Gipiemme groups. The steel clamp version would probably add 15-25g. Details: The best of the Simplex lines of components. Consisted primarily of Front and Rear Derailleurs as well as Shifters. The SLJ designation was also given to other parts occasionally such as seat posts.